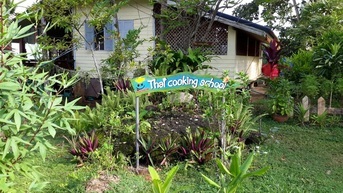 What makes smile koh mak thai cooking school different ? Why choose Smile Koh Mak thai cooking school ? - Courses are given in english , in a traditional Thai family style , you will discover the thai sanouk and understand why Thailand is "the land of smile "
- Cooking is done in a clean ,open air kitchen , by the beach , where you can enjoy a great sea view ! - Class size is limited to 4 persons in order to maximize individual attention. that includes the recipes you have learnt. Already in Koh Mak ? I will be very happy to explain you our classes ; If you have special request or needs that the best way to tell me !